Our original plan for Friday had been to breakfast at the Camellia Grill, which we had read good things about. However, our plans to attend the New Orleans School of Cooking on Thursday had been thwarted by the flight cancellation, so we had rescheduled that to Friday. By the time we got out of the hotel, I didn't feel that we had time to make it to Camellia Grill and back. Weep not for us, however: since the Camellia Grill was not an option for us, we went to Brennan's instead and had an extraordinary breakfast. I had a few second thoughts because Brennan's isn't exactly Roadfood--but Brennan's is certainly one of the classic restaurants of New Orleans, and originator of many recipes that have been adopted elsewhere (such as Bananas Foster), so it does have a cultural heritage behind it. Breakfast at Brennan's is quite an affair. Brennan's turns out to be a restaurant that expects you'll want to begin breakfast with a cocktail and enjoy wine with your breakfast (we did not). We both looked at the menu and wanted something that was a reasonably complete breakfast, but in the lower echelons of price--and this turned out to be the three-course prix fixe breakfast. 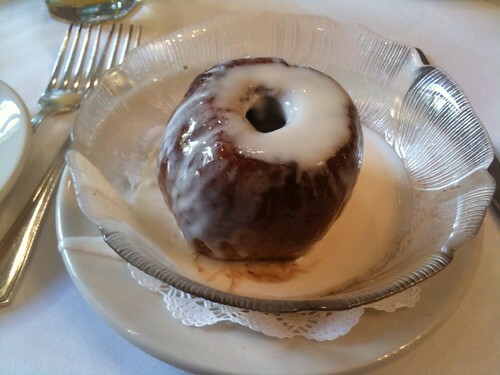 For the appetizer, we both chose the Southern baked apple with double cream. This was baked almost-tender, to the point that it could be carved with a spoon, and generously topped with sugar, cinnamon, and cream. This could have been a delicious breakfast all by itself. 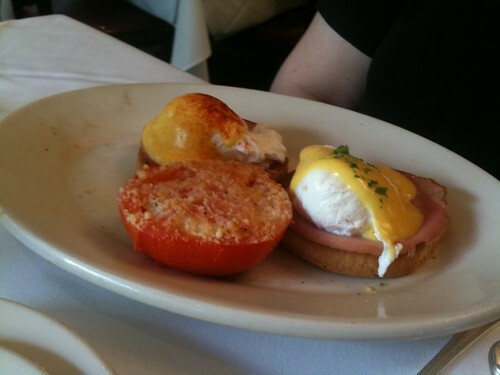 Lori had the eggs Benedict for her entree. They were excellent. They used rusks of bread as the base instead of English muffins, and this plus the tender Canadian bacon made it much easier to get a bite with every layer of the eggs at once. It also came with an excellent side: a broiled tomato with cheese, also tender enough not to require a knife. My entree was the eggs Hussarde, which were much like eggs Benedict with the addition of a Marchand de Vin sauce (made with beef broth, mushrooms, ham, and other things). 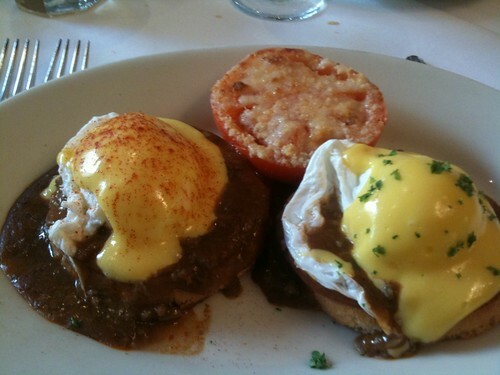 Lori's eggs Benedict were excellent, but these were much much better, simply out of this world. 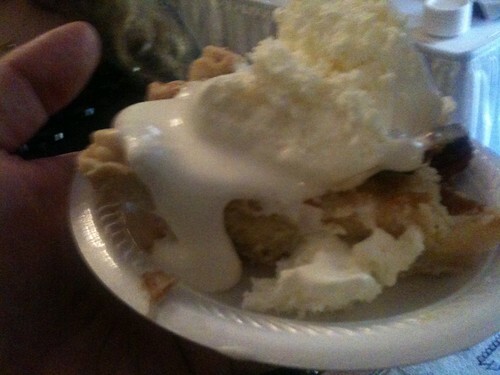 For dessert, we zoomed in on the desserts marked "Brennan's Creation". 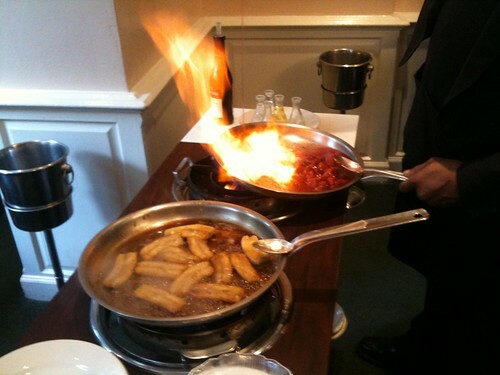 Both of these ended up being flambeed: I got the bananas Foster, and Lori got the crepes Fitzgerald. Both of these were flambeed at the table, and both were wonderful. I should also mention the service. 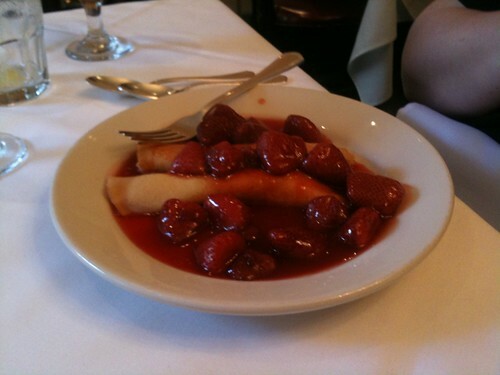 The waiter, Ray, gave us really excellent service and was extremely friendly. 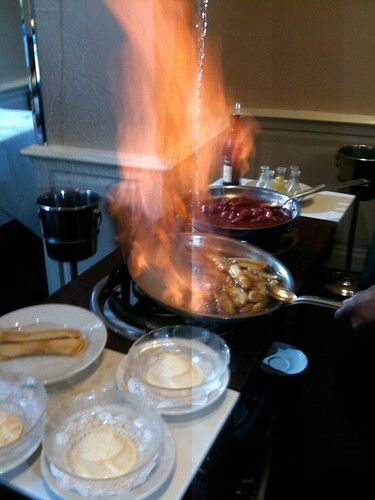 Particular moments of great service: he knew how to tell us the exact time to take pictures of the desserts bursting into flame, and he gave us Brennan's recipes for the two desserts. And when I encountered him on the street the next day, he recognized me and we spent several minutes chatting about the festival. 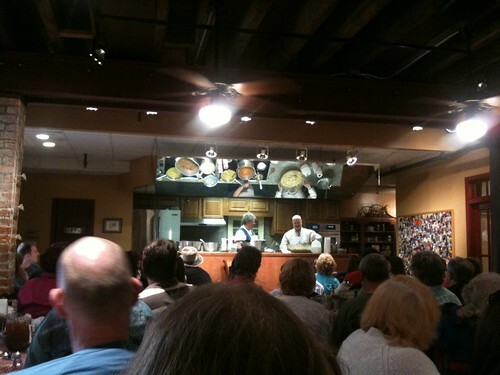 After that, we strolled over to the New Orleans School of Cooking. We had an enjoyable lecture and cooking demonstration from Ann, a grandmotherly woman who had been a former elementary teacher and tour guide. We definitely noticed that she had a generous hand with the cream. Crawfish étouffée--too spicy for Lori, but I liked it. We had a mishap: when she was portioning out the étouffée, she forgot about our table. When I pointed this out, she was chagrined and made us a special batch. Bread pudding--tasty, but probably the third best we had. Pralines--the class taught me that Louisiana pralines are traditionally the crumbly and brittle type, instead of the chewy caramel pralines I prefer. But now I know! Abita beer and root beer--Abita is a local brewery. The beer was pretty good, but not exceptional. The root beer, on the other hand, was quite nice indeed--I wish I could get that easily in Pittsburgh. After finishing our meal and shopping for culinary souvenirs in their gift shop, we strolled over to the French Market. 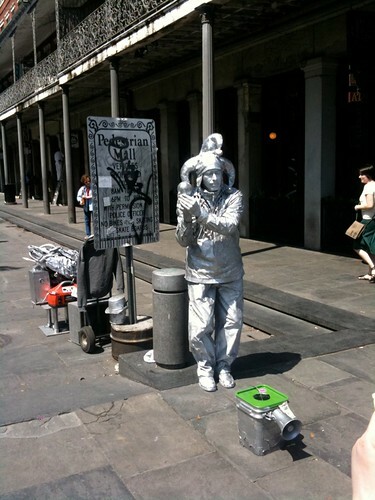 On the way, we saw a silver example of New Orleans' "living statue" style of busker. I've seen this style in Vancouver in 1998, but not elsewhere that I've traveled. This particular statue wasn't completely stationary: he also did contact juggling. We spent a while shopping in and near the French Market, but didn't manage to cover the whole flea market before it was time to head back to Cafe du Monde for beignets. 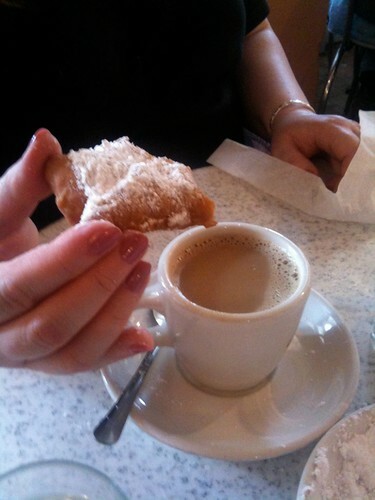 I'm glad to have gone to Cafe du Monde, but I wasn't enraptured by the place. The beignets were good as a sturdier donut. But the drifts of powdered sugar got Into the air and dusted every surface, and that made the place feel messy and grungy to me. We took a mule-drawn carriage back to the hotel. This was all for Lori's sake, but that is okay, because she did enjoy it. We changed clothes and strolled over to the opening night party. We arrived at the party fifteen minutes early to meet the food-creators, but the party was already well underway. Michael Stern noticed us and suggested we visit the Brick Pit BBQ first, because they were having trouble keeping the meat warm. We are too wise to pass up such a suggestion. 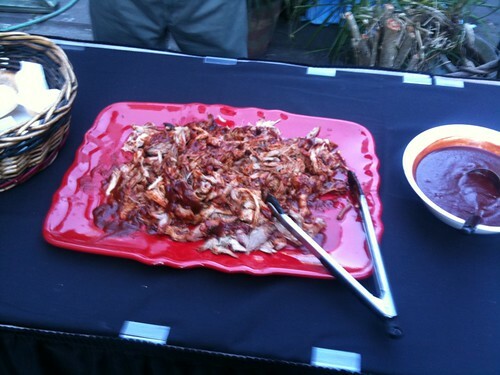 The Brick Pit pork (smoked for thirty hours, the owner said) was really splendid. The smokiness wasn't intense, but it had a long lingering flavor that took several seconds to fully express itself through the tender meat. 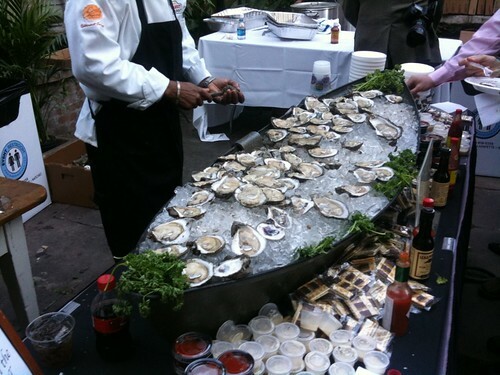 Next to the crawfish boil was a boat of raw oysters. 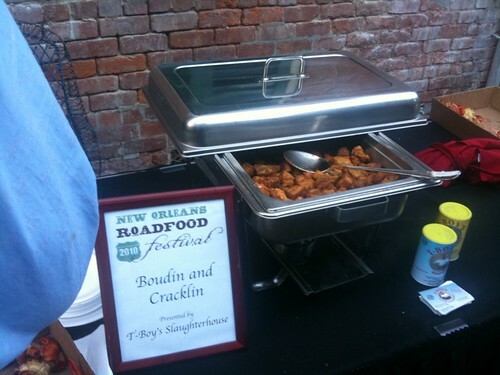 (Provided by Creole Cuisine, I think--I didn't write down the name.) This didn't really make an oyster fan out of me. I would have liked to have sampled a bunch of different condiments with them to see how I most like oysters, but stomach space was at too much of a premium to sample dishes more than a few times. Creole Delicacies was providing fresh-made pralines. Mmm. Pralines are even better when still warm. Cincinnati-style chili from Camp Washington Chili Parlor came unescorted by any Cincinnati staff. I found it only so-so; I expect it wasn't at it's best served lukewarm on a warm night. 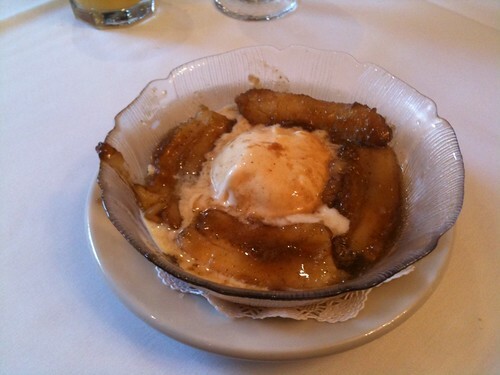 K-Joe's provided bananas Foster bread pudding. Those who are keeping count will note that this was the fourth bread pudding I had sampled in two days. This also suffered from the setting of the party, I think; I don't remember it having the richness of my favorite bread pudding. 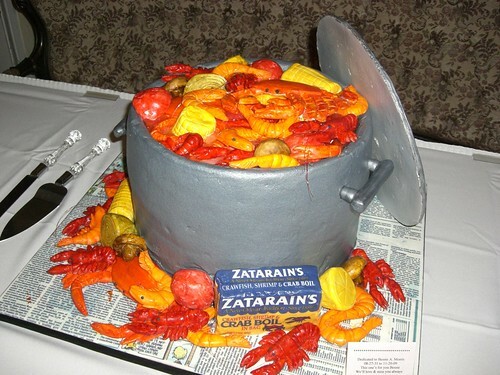 Next to the bread pudding was a cake that was impressively decorated to look like a crawfish boil. 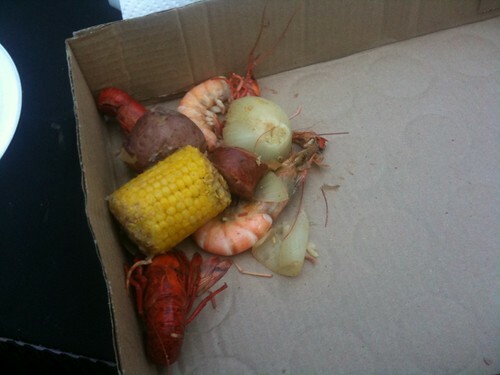 The natural question this raises for me is "what should a crawfish boil cake taste like?" Unfortunately, I don't remember the taste well--basically, it tasted like cake. The color of the cake interior was a light purple, for all the clue that provides. The party also gave us the pleasure of watching Anthony and Gail Uglesich receive the Blue Plate Award. Anthony Uglesich was clearly extremely moved by the honor, and that made me appreciate the honor much more. After the party, we rode with Stephen Rushmore to Patois, a nice restaurant in the Garden District. Unfortunately for my goals, this was a bit crammed and noisy; we were seated at two tables, so I missed all chance to chat with the Uglesiches, and even at our table, it was hard to hear conversations well. The menu was very nice and everything was prepared very well, but I didn't feel the sense of "only in New Orleans" that I got at most of the other eateries we visited. I am not a habitual cocktail drinker, but I wasn't driving and their cocktail list looked interesting, so I ordered a "fleur de lis". 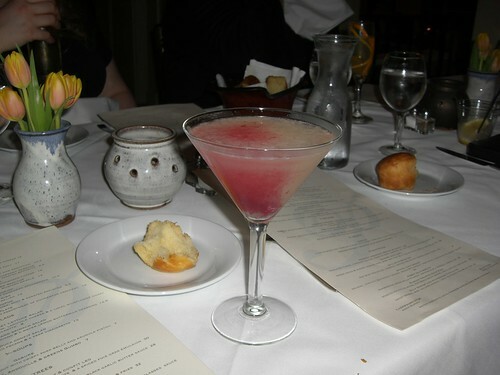 (Menu description: "blood orange, vodka, limoncello, St. Germain and lemon juice. Served up and topped with champagne".) This was one of the best cocktails I have ever had. The flavor was bright, full, and lively; it clearly belonged to the large family of sweet drinks, but it didn't have any of the cloyingness of sweet drinks like orange juice. And it was an amazingly beautiful drink. The blood orange juice cohered to itself in the glass like a crimson coral, and this effect lasted until the last sip. My photo doesn't do it justice in the slightest. Lori had the Almond Crusted Redfish, which she judged excellent (high praise from her, because she is normally a fish frowner). I had the gulf shrimp and house made fettucine with sweet onions, baby collard greens, local blackeye peas, and chilies. I found the fettucine marvelously tender, but the blackeye peas were hard and unpleasant, and I noticed no distinctions of the shrimp.